Spanish Prime Minister Mr. Pedro Sanchez has reason to be worried. Not only did parliament reject his party’s deficit ceiling proposal (Mr. Sanchez’s socialist party would like to spend more on pensions, benefits, and healthcare as this would aid his voters), the press, which is heavily influenced by the conservative party, is showing images of illegals crossing the border on a daily basis. Related coverage: <a href="https://thegoldwater.com/news/32820-Spain-Chaos-As-Nationwide-Taxi-Strike-Blocks-Major-Cities-Video">Chaos As Taxi Strike Blocks Spanish Cities</a>. Whereas we showed you how last week boats arriving directly on the tourist beaches of Andalucia, this time it was in the Spanish city of Ceuta (located in Northern Africa) where 22 police officers were injured trying to stop a thousand or so African migrants trying simultaneously to cross the border. In the end, as police forces were totally overwhelmed, a large group of them successfully reached the Spanish exclave. 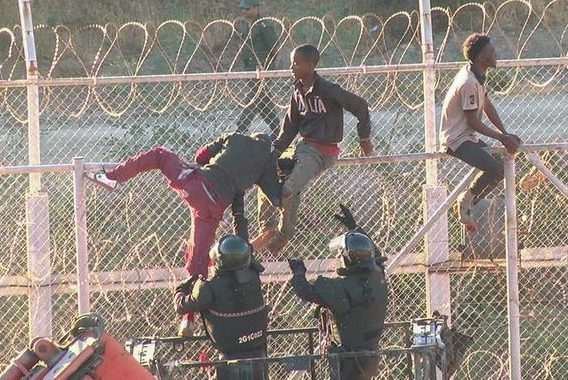 Joining those that arrived there last week, there are now 600 illegals in Ceuta waiting for asylum procedures. The newly elected president of the conservative People's Party (the largest opposition party of former Prime Minister Mariano Rajoy who resigned over a corruption scandal), Mr. Pablo Casado, has taken a hard swing to the right (sensing the mood of the country) and adopted a distinct anti-immigration position. According to the People’s Party, the "millions" of Africans that are waiting to cross over to Europe can only come via Spain now. Related coverage: <a href="https://thegoldwater.com/news/32628-Spain-New-Wave-Of-Illegal-Immigrants-Arrive-Directly-On-Beaches-Video#32650">New Wave Of Illegals Arrive Directly On Beaches</a>. Mr. Casado said: "there can't be papers for all, we have to say it even if it's politically incorrect." However, Mr. Casado then traveled to the immigration camps where he shook hands with the illegals, much to the confusion of onlookers. In one week since our last report on this issue, the number of illegal crossings into Spain have risen another 10% to 22,000, according to data from the Spanish Interior Ministry. The summer weather as well as the closure of the Italian (via Libya) and Greek (via Turkey) routes are the main drivers behind the significant increase in numbers. Political scientist José Fernandez-Albertos of the Spanish National Research Council (CSIC): "The government is in a weak position, given the diversity of the parties it depends on to bring any initiative forward. Despite that, this shouldn't be a difficult topic to negotiate, even if there are unexpected turns." Mr. Fernandez-Albertos believes that the spectacular images reproduced by the media that leave an impression on the Spanish collective consciousness are not beneficial to the issue. He claims: "people watch TV and see how the public order is disturbed on beaches or towns they know. They see overwhelmed policemen unable to contain something they don't understand. They would like to see things come back under control." "Even when there's a small number of people coming in, the issue's media visibility is very high. This can change the terms of the debate." "reaching worrying levels…" one savage is a "worrying level". too late to start worrying now.